This version of the randomly connected binary network brings us closer to some good examples of emergent behavior and self-organization. The circular orientation of the binary nodes and the method in which the nodes are connected often creates closed loops. Closed loops are node connection paths that eventually loop back on themselves. This looping provides a source of feedback. Feedback is the key to all self-organizing systems. figure a. A close up of four 'unlit' binary nodes. The centers of the nodes have been exposed to show that connection polarity exists. 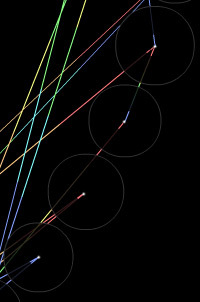 Connections have been colorized to show their one-way nature. In this particular instance, connection logic reads from red to blue. That is, a node will check all locally red connections to determine state. The blue connections of a node are indications of dependencies from other nodes. Notice the effects certain nodes will have on the rest of the system. Some very peculiar arrangements can be discovered with enough experimentation. Certain arrangements will produce harmonic lighting patterns, complicated waves of activity, or induce external looping with seemingly random influences. Sounds were assigned to individual nodes to help the user discern repeating patterns. However, the particular choice of sounds is probably not well suited for this task. Further iterations on this self-organizing system produce some astonishing results. See versions four, five, and six.